Whether you need them for a birthday party, another special occasion or just because, rainbow cupcakes are fun, unique treats that are sure to brighten up any day. At first glance, it's easy to assume that a lot of work is involved in creating these delectable desserts, but it's a lot simpler - and more enjoyable - than you probably think. For simplicity's sake, go ahead and buy a package of white cake mix. Stick with a reputable brand to ensure superior quality and taste. You will find great deals on premium white cake mixes at Sweet Treat Supply. You'll also need white buttercream frosting to act as a base for your rainbow icing. Since you'll be making rainbow patterns, food coloring is an absolute must. Buy a basic pack of primary colors — this one is a great option — and mix them to create additional colors. Tally up how many different colors you'll be using to determine how many mixing bowls and spoons you'll need. Make sure you have the ingredients you'll need to make the cake batter, and round up your mixing bowls, spoons, rubber spatulas and other essentials. That's it - now it's time to get down to business! Prepare the Cake Batter - Follow the instructions on the package of cake mix to prepare the batter. Divide the Batter - Split the white cake batter as equally as possible into separate, small mixing bowls. It's crucial to keep each batch separate to ensure that your cupcakes look like rainbows and not like a strange mishmash of colors. Add the Food Coloring - Add two to three drops of the food coloring of your choice into each batch of cake batter. Be sure to use separate spoons as well to keep the colors as bright and vibrant as possible. Mix each batch thoroughly to ensure color uniformity. Prepare the Cupcake Pan - Place paper liners in the cupcake or muffin pan. Pouring the batter directly into the pan can cause extreme darkening, so don't skip this step. Pour the Batter - Go down the line pouring one color of cake batter after another to create a layered effect. 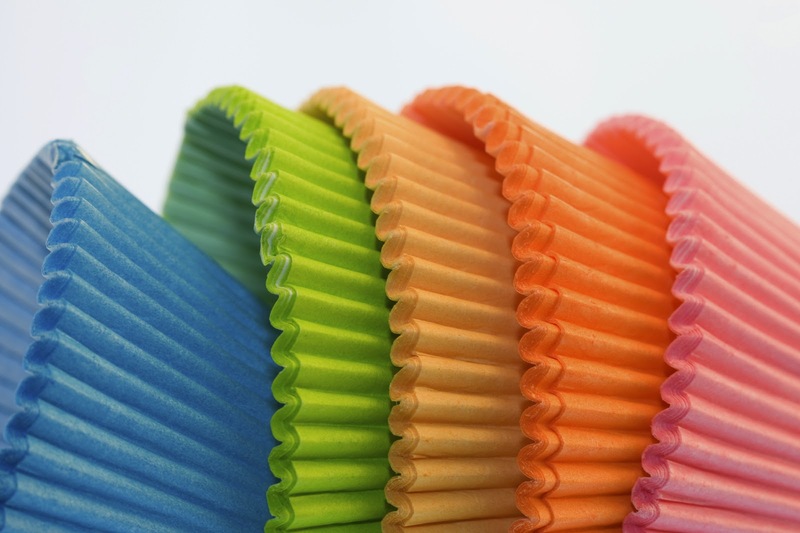 Bake the Cupcakes - Follow the cake mix directions to bake your cupcakes to perfection. Prepare the Frosting - While the cupcakes are in the oven, split the buttercream frosting into three small bowls and use food coloring to dye them different colors. Fill a plastic baggie with all three colors, and cut a hole in one corner of the baggie. Add the Frosting - After they've cooled sufficiently, squeeze frosting onto each cupcake, and then swirl it around with a fork to create a tie-dye effect. That's all there is to it! You now have pretty rainbow cupcakes that are just as fun to look at as they are to eat!